The arrival of hashtags on Facebook opened a huge opportunity for social media marketers to take advantage of the company’s 1.15 billion monthly active users. Even though most hashtags are used by average users for common or trending topics, some of these will undoubtedly be driven by interest or related to a brand – something marketers could draw on. Social media marketing has received a new tool for efforts in lead generation and appointment setting, thanks to hashtags. It allows Facebook users to see an aggregate of all content available related to the topic appended. This is valuable for businesses who want to engage with customers and attract prospective clients from their social media accounts. Before hastags arrived, the ability to keep track of trends and rummage content has been a major drawback in using Facebook for marketing, an unsatisfying state of affairs for marketers searching for sales leads. Hashtags transform words, phrases, and topics into clickable links within status updates on your personal timeline or your Page, and help people find posts about topics they’re interested in. You can easily create a hashtag by writing the number sign, “#” (without the quotation marks), and a word or phrase as a single word (without spaces), and add the resulting block of characters to a certain post. For example, “Rise and shine, #NewYork.” When you click that “#NewYork” hashtag, you will see a feed of posts that also have the same hashtag shared by other Facebook users to their friends or the public. Personal and corporate brands can make the most of this tool by appending hashtags to relevant posts, not arbitrarily. If a certain post is striking or interesting, it also will attract Facebook users to visit the official website, most likely leave their contact information, and give the telemarketing team something to be busy with. When hashtags gained traction on the social network, it has been relatively easier and faster to provide a channel for users to find targeted content, an advantage content marketers are aware of. The new opportunity helps build communities and networks, together with the targeted collection of market data for analysis and eventually, lead generation. There practically are no limits on the topics and phrases you can create with hashtags, and capitalization does not matter either. Moreover, you may search for hashtag results through a simple modification of a URL. For instance, www.facebook.com/hashtags/thevampirediaries will show you recent results of posts appended with the hashtag #TheVampireDiaries. But how can you make the most of Facebook hashtags in your marketing efforts? 1. Whether or not the new tool is enabled for your account, use interest-driven or brand-related hashtags in public Facebook posts on your personal profile and business page. Facebook users with hashtag enabled will see these hashtags as clickable links. 2. Every Facebook hashtag comes with a specific URL and a status update box. Use various marketing techniques to drive traffic to the URL to trigger and prolong conversations. 3. Add hashtags even when you post from a smartphone or tablet. Hashtags are now supported on mobile devices. 4. Use hashtags to spark conversations within a group. Each word or phrase you convert into a hashtag will have its own status update box. 5. Mull over the industry you are in and target market you want, apart from the types of hashtags you post outside of Fashbook. 6. Append hashtags to trending topics in your industry. 7. Up to two hashtags per post or status update is enough. Never flood a single post with hashtags. 8. Capitalize the first letter in each work to make it more intelligible. For example, #SocialMediaMarketing, not #socialmediamarketing. As a social media marketer, will hashtags have a major impact on the reach of your posts? Will this Facebook feature engage more users and prolong conversations? 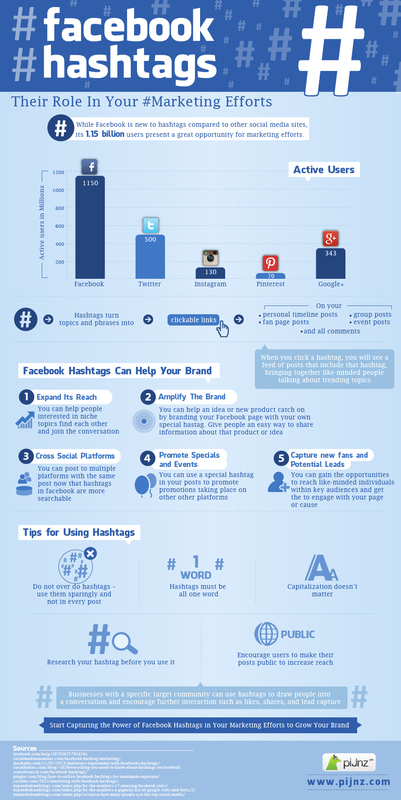 Here is an infographic by pijnz.com to help you better understand Facebook hashtags and take advantage of it in your marketing campaigns to grow your brand.